For now on the quality of air condition, the non air pollution personal transporter has significance meaning of environment protection. Let’s travel with electric unicycle, the Airwheel unicycle transporter and refresh the air by travel with Airwheel unicycle and refreshing the polluted air. Airwheel unicycle, due to the use of electrical energy as the power, therefore has "zero emission" reputation, now the people travel transporter , one is car, another is electric bike, bus, and subway, among them, the car is most widely used, using the gasoline as power fuel car, as the number increased, the emission more and more tail air, which polluted the air quality, more and more influence the breath quality. 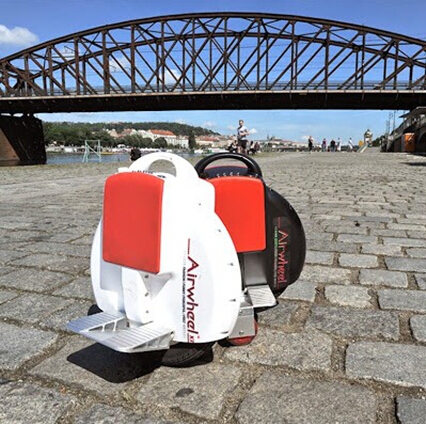 The zero emission of Airwheel is the most needed character of personal transport, only short time ago, the air is still the basic right by human need, this use to be the basic resource of people, after experience of pay price to the environment with fast developing, nearly all resources has been destroyed by human, but now, the qualified air quality less and less. for the most city, only some special area like park or suburb are and running at the weekend, can enjoy the truly fresh air, without， It is no exaggeration to say, the air quality have effecting the people happy life. Airwheel unicycle, By small size it can go through any space, so that the traffic jam will not happen, it applied the lithium battery, it will riding 20 km by adults, which fully qualified the short commuter need. When using Airwheel Self balancing unicycle during traveling, no tail air emission, to the air, it is friendly products, more people choose Airwheel, less air polluted, if everyone wish the fresh air, then try your best to choose the Airwheel unicycle. To the currently air quality, using the clean non polluted personal transporter has significance environment meaning. The air has no color, no odor, but to the people’s life, it will have very important effect, no one can survive without air, so! Let travel with it, clean up the Air! Previous：Watch Out for Counterfeit Smart Electric Unicycles!